« More Proof that a Health vs. Weight Focus is Best! There’s an herbal renaissance going on! We’ve “been there, done that” and now we’re embracing the things of nature – the way our parents and grandparents did years ago. And “taking tea” makes us slower our pace, quiet ourselves, appreciate the moment and give thanks. Herbal teas are in the forefront not just because they’re different, but because herbal teas are good for you. If you’ve ever brewed a cup of peppermint tea after an unsettling meal, or sipped some chamomile tea at bedtime to help you sleep, then you have taken advantage of the natural properties of herbs for therapeutic value. Herbs have no caffeine or calories. Remember, the body’s healing begins from within, so it makes sense that one of the best ways to use an herb’s curative properties is to brew it into tea and take it internally. When boiling water is poured over an herb and the herb is allowed to steep, the herb’s cell walls are broken releasing soluble organic compounds and essences into the water – that’s why herbal teas smell so great! Pour boiling water over tea herbs: Use 1 cup of boiling water to 1 teaspoon dry or 1 tablespoon fresh herbs per cup. If making in a pot, add an extra teaspoon or tablespoon (if using fresh) – this is called “one for the pot”. Cover to prevent aromatic steam from escaping. If using a cup, place saucer on top. Let steep for 3-5 minutes and then strain. With few exceptions, don’t steep longer because the tea will have a bitter flavor. If you want a stronger flavor, add more herbs. To sweeten herbal tea: A natural herb, like Stevia, or honey. Ginger (yes, it’s considered an herb, or a spice, depending upon which part of the plant you use), lemon, honey, cayenne pepper. Good for upper respiratory ailments. I use a generous tablespoon of fresh ginger, and add lemon, honey and cayenne pepper to taste. The ginger calms your tummy, the lemon gives you a jolt of vitamin C and helps clears mucus, the honey is already digested for you to give you natural energy and the cayenne helps you breathe and also stimulates the body’s natural defense system. 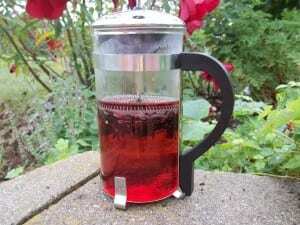 Mint and Hibiscus: The mint cools and is good for digestion. Hibiscus helps reduce blood pressure and is full of antioxidants. Thyme and sage – great for sore throats. Chamomile, rosemary, a squeeze of lemon and a cinnamon stick – a nice spicy, yet calming, tea. With cinnamon, you’re adding a powerful antispetic which helps your digestion. Japanese researchers report that cinnamon helps reduce blood pressure. or even a squeeze of lemon juice – helps digestion and helps calm a cough. Lavender, Chamomile, Dried apple peel, Bee Balm (also known as Monarda, Oswego tea, and Bergamot tea) and Rose Hips: Relaxing and soothing – the rose hips contain vitamin C and A and help reduce coughs. Bee Balm has a minty flavor and helps reduce nausea. Spearmint, lemon balm, hibiscus flowers, lemon peel, rose petals and cinnamon sticks. Makes a wonderful iced afternoon tea, perfect for a pick-me-up. Green Tea: Very trendy right now, and with good reason. It is China tea that has been dried but not fermented, making for an extremely healthful brew. It is somewhat citrusy in taste. Gunpowder green is my choice. Adding a squeeze of lemon or even orange is an added healthful boost. I like to swirl a cinnamon stick in there, too. Dried Apple Peels: I know what you’re thinking, but these make a very healthful tea and much of apple’s healing power is in the skin. The skin contains large amounts of quercetin, an antioxidant. Add a few to your regular tea! Hot Apple Juice/Cider with cinnamon: Again, another way to give your body a cold-fighting boost. I hope you enjoy my “potions” – I love sharing them with you, as these are time-proven, handed down by my ancestors from Lebanon to my mother, and then to all of her children.